In 2015 it was estimated there were 1,500 to 2,000 mobile medical clinics in the United States alone, receiving well over 5 million annual visits. That may seem like a large number, yet considering a conservative estimate from the 2010 U.S. census data, 5 million is less than 1 percent of all patient visits nationwide. Mobile clinics operate in every state across the country, in Washington, DC, and Puerto Rico. In 2013, of all mobile health clinics in use nationwide 644 units were registered on the Mobile Health Map project. It is estimated that each mobile clinic serves an average of 3,100 patients per year, totaling approximately 5 to 6 million visits annually. Mobile medical units not only improve access for vulnerable populations, but also support prevention, provide chronic disease management and reduce costs for those in low-income brackets. Many owner-operators of mobile units (hospitals, universities or other healthcare organizations) operate vehicles especially tailored for primary care, pediatrics, bloodmobiles, mobile dental clinics, mammography, occupational medicine, mobile laboratories and even nuclear medicine. A mobile health clinic can provide many cost-savings benefits to a healthcare system. When prompting earlier diagnoses and treatment, improving the patients’ ability to self-manage their health, reducing emergency room visits and hospital admissions and improving the overall quality of life of clients, a healthcare system can see reduced operating costs and an increase in patient referrals when a client’s diagnosis requires more extensive care. Mobile medical units can significantly improve cost-savings by reducing unnecessary emergency room visits. A 2015 Cost Trends Report conducted by the Massachusetts Health Policy Commission estimated that more than 40 percent of ER visits between 2010 and 2014 were either non-emergency or could have been managed by a primary care physician. In 2010, the average cost per avoidable ER visit was $474. That same year there were over 1.1 million avoidable ER visits at a total cost of more than $558 million. The report concluded that communities of minorities and those with the lowest average income had ER visits that could have been avoided far more than those from communities with the highest average incomes. This confirms the need for more accessible health care to combat these significant health disparities. The model for healthcare delivery using mobile clinics is typically a partnership with hospitals, health systems, and insurers to improve care and lower costs. The Mobile Health Map is a collaborative network and research community that provides tools and services for mobile health clinics to easily analyze their own impact while contributing to a broader pool of data. Mobile Health Map aggregates the data across clinics to study the impact of the mobile health sector as a whole. Mobile Health Map provides an online portal complete with analysis tools, research, best practice resources and opportunities to connect with peers across the country to broadly advocate in support of mobile health services. With resources and research pooled from over 700 mobile health clinics across the United States, Mobile Health Map helps organizations develop sustainable mobile health clinic programs. The process outlined below describes the primary steps when considering a mobile medical clinic. Identify low-income, minority and/or rural populations who have disproportionate access to healthcare, demonstrate an undue burden of ill health and who may be under or uninsured. According to Mobile Health Map, mobile clinics provide a wide variety of services. Prevention and primary care are the most common. Mobile clinics carry out the top 25 most-defined clinical and cost effective prevention services cited by (National Partnership for Prevention). The average clinic creates 64 years of health overall for its patients over their lifetimes. Screenings that contribute most to improvements in health include colorectal cancer screening, breast cancer screening, smoking cessation advice, childhood immunization and obesity screening. Patients who would utilize a mobile clinic typically have diverse backgrounds of social circumstances and cultural beliefs, often felling apprehensive about authority or even healthcare practitioners. It is vital to employ a staff who have a compassionate “neighborly, friendly and helpful” demeanor toward their patients and who will provide nonjudgmental care to encourage an environment of trust. Develop relationships with social service agencies, community health clinics, rehabilitation facilities, food pantries and even local first responder organizations (such as fire and police departments) that are known and trusted in the community. These groups can help with referrals for clients who rely on assistance beyond the resources of the mobile medical center and can help in designing the objectives of the program. Gain input from these community organizations and patients to learn about the unique needs of their community and to best understand the ideal methods for meeting them. As stated above, mobile medical units can offer a wide variety of services, including: prevention/screening, primary care, mammography, dental, specialty medical care, help with homelessness and more. The services you identify to be the best fit should target the most significant needs of the community your organization will serve. Research the opportunities for acquiring grants, and raise funds from corporations and foundations to purchase the unit the will best suit your community’s needs. a. Be sure the vehicle is rugged, built to last and adaptable to your specific requirements. b. Avoid inexpensive box store furnishings which look nice, but are not comfortable and will quickly wear out. Try to select a vendor who will use premium, commercial-grade furnishings, doors, flooring, and walls. c. Have an interior that will provide a welcoming and unintimidating environment that has a comfortable waiting area, and exam and procedure rooms. 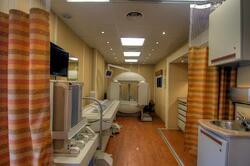 Ensure the layout will provide secure patient confidentiality, disabled persons' access, and proper sanitation. Coordinate with the community organizations to establish what populations and geographic locations can most benefit from your mobile medical program. And confer with local residents to identify convenient, easily accessible locations where the vehicle can park. Establish your value proposition and plan your marketing to support your purpose and objectives. c. Make sure your vehicle has attractive and informational exterior graphics to serve as a traveling billboard. d. Advertise, solicit PR and feature articles in local newspapers. Ensure a collaborative relationship among staff and your organization’s management to review needs that are observed in the community and the merits and feasibility of adding new services to address them. On a periodic basis, evaluate the impact of your program has on the community and be prepared to make adjustments that will provide the most needed services. Calculate the return on investment of your Mobile Health Clinic at least quarterly to ensure your program is not just breaking even, but is showing a profit. Most of the trackable profitability will come via patient referral to your home organization. Mobile clinics play a critical role in providing high-quality, low-cost care to vulnerable populations. In the current environment, which is placing a renewed emphasis on increased accountability among state, federal and local communities to provide adequate health management to the overall population, more mobile clinic manufacturers are partnering with hospitals, health systems and insurers to work toward improving healthcare and lowering costs. To learn more about establishing a mobile medical program and how it can help protect your service market, click the button below to study our white paper.